It has been a perfect young summer week here in our Midwest garden! Our above-average rainfall in May has made the first week of June oh-so beautiful. This afternoon, as I worked in the Herb Garden, I had lovely company. Several robins kept me entertained as they splashed in the nearby birdbath, flew to the picket fence, and filled the air with their birdsong. A young rabbit happily munched on clover in the grass. Our Friendship Garden bed is just beginning to show its June colors, with pale purple Iris, yellow Iris, deep purple Siberian Iris, bright pink Peony, deep blue Spiderwort, and delicate, white Anemones in bloom this week. 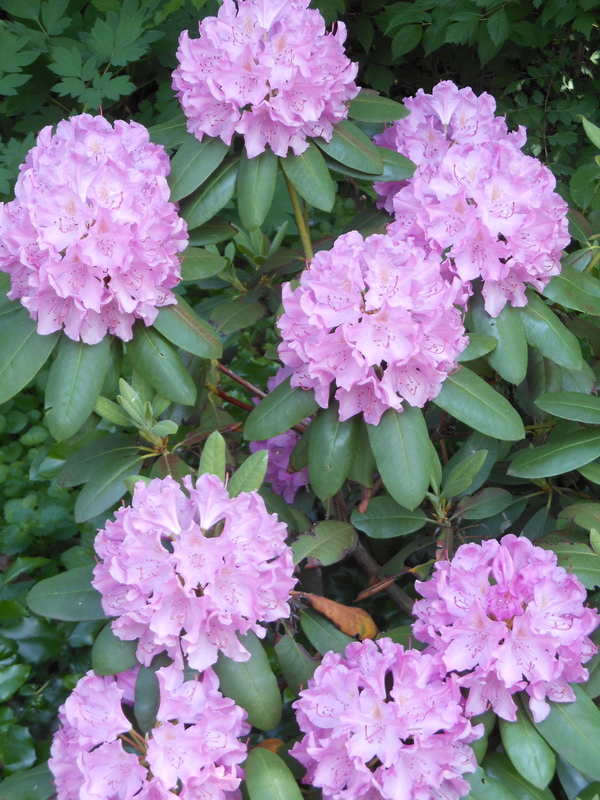 These special perennials are all gifts from the gardens of friends. Admiring at each plant always brings warm memories of dear friendships in my life. 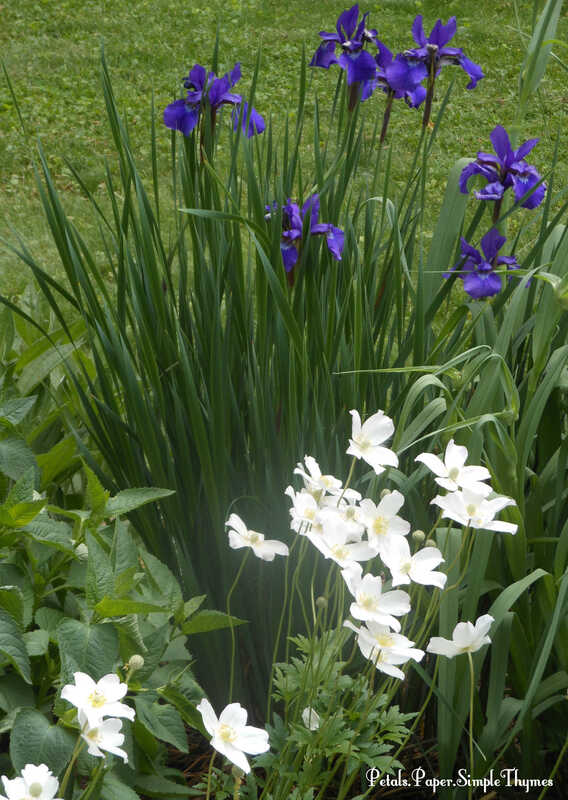 Deep purple Siberian Iris and delicate, white Anemones show off their colors and distinct foliage. Bright pink Peonies and creamy, white Peonies add a heavenly scent to the Friendship Garden. 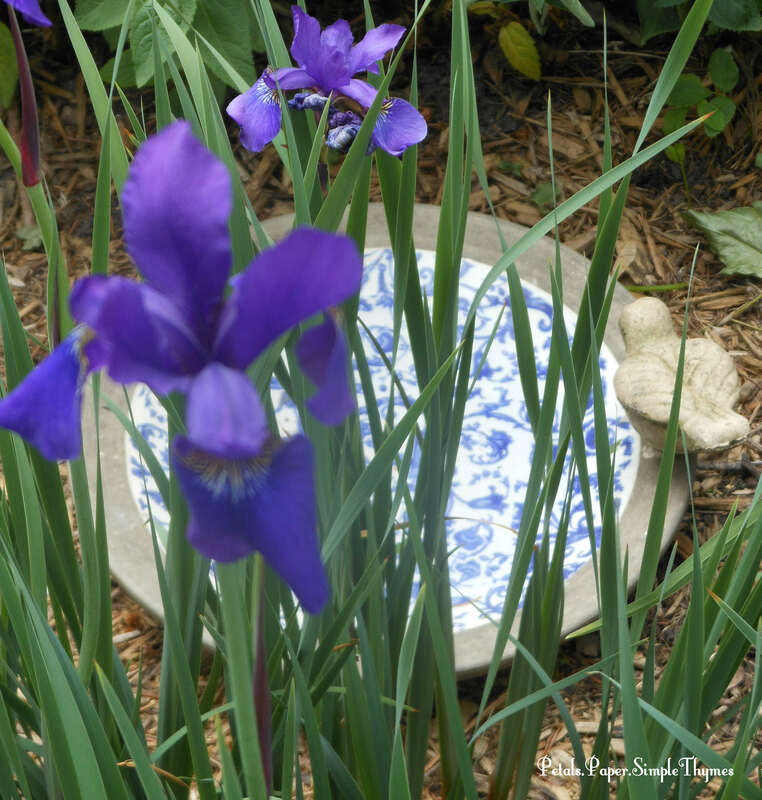 The slender, spiky foliage of Siberian Iris provides a sheltered area for a pretty birdbath. 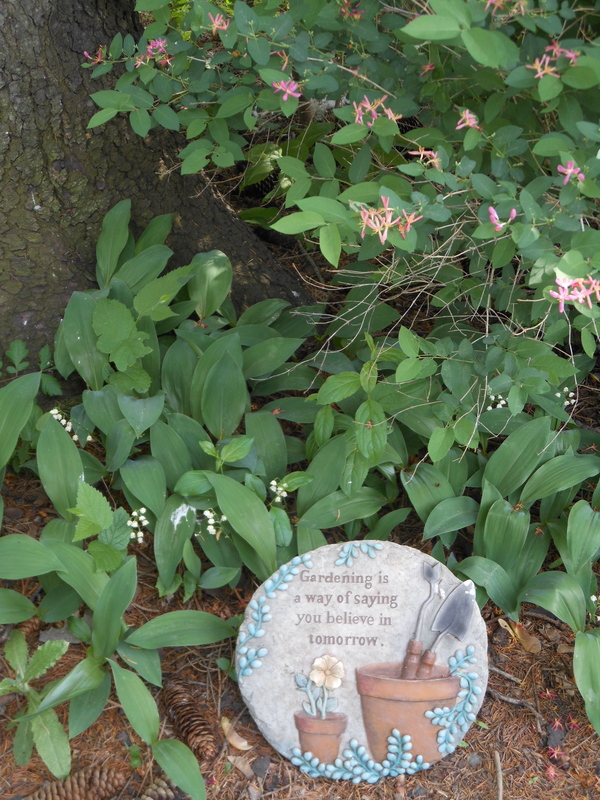 This simple bee bath is a new addition to the Friendship Garden this week. 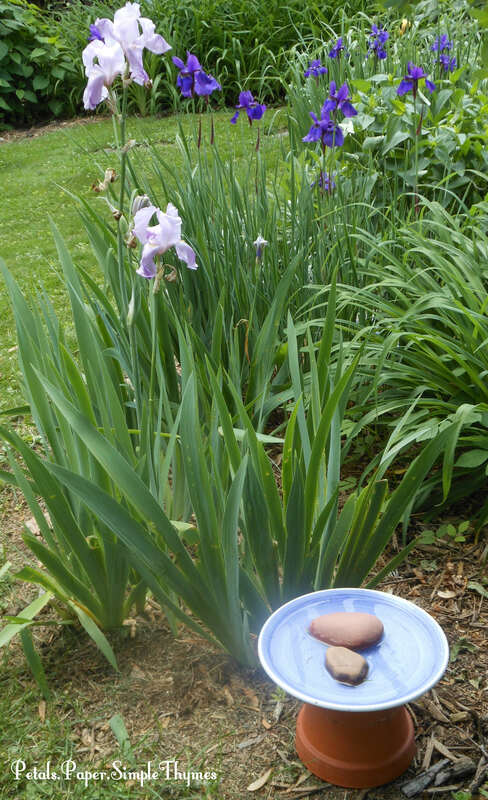 A shallow bee bath, with rocks to land on, will encourage bees to stay longer when they visit the garden It was inspired by the amazing Stephanie who blogs at Garden Therapy. I simply used a clay pot base, a shallow, stoneware bowl from the thrift store to hold fresh water, and river rocks. Now we have bee baths in the Friendship Garden, the Herb Garden, and the Cutting Garden to encourage pollinators to stay awhile. Gardenkeeping has filled my days this week, as I work to pull out groundcover-gone-wild from several flower beds. The culprit is Bishop’s Weed (Aegopodium podararia). This fast-growing groundcover was already growing in the garden when I moved here 28 years ago. 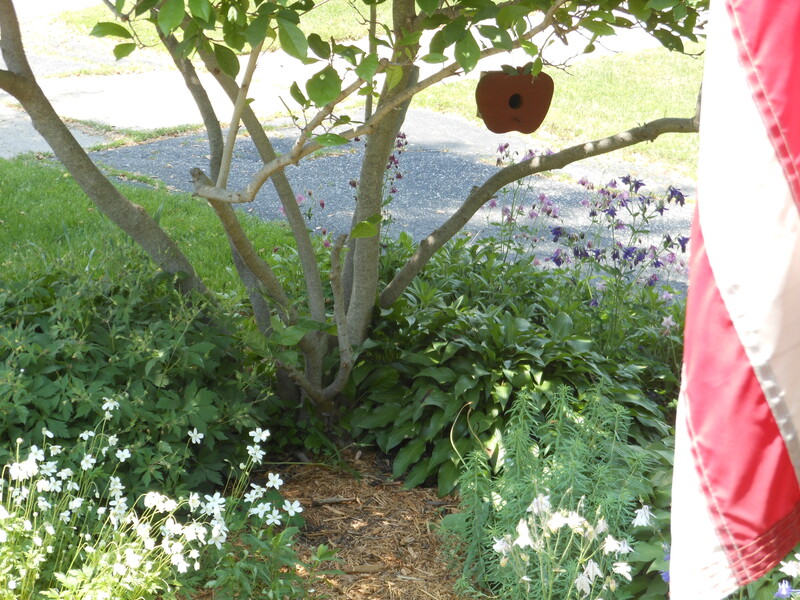 In spite of constant attention, it spreads vigorously by shallow roots under the layer of mulch. Our rainy weather last month really jumpstarted its rapid growth. In June its white flowers, looking a bit like scraggly Queen Anne’s Lace, bloom atop 3 ft. stems. Each spring, I work so hard to pull out the Bishop’s Weed and dig its roots out of our Front Porch Garden, where it invades the Hostas, Hydrangeas, Salvia, Daylilies, Anemones, Coreopsis, and Dianthus. Although it remains a constant work-in-progress, I am very grateful for the damp soil this week that makes the job a bit easier! Since we had close to 5 inches of rain during May, our soil remains quite damp. One thing that I am being mindful of is preventing soil compaction in our garden beds. When the soil is packed tightly, it is more difficult for the roots to grow and water runs off, rather than soaking into the soil. According to Garden Gate magazine, “Studies have shown that 80% of problems affecting plants may be caused by soil compaction.” If the soil is compacted, there may be fewer flowers. Did you know that foot traffic in the garden beds affects the top 6 inches of your soil? ⚛ Creating narrow garden beds or border gardens, reachable from both sides, reduces the need to walk through the beds. ⚛ In wider garden beds, walking on stepping stones or a path can reduce soil compaction at the base of the plants. ⚛ Try to plan gardenkeeping tasks, like weeding or deadheading, when the soil is dry. ⚛ Mixing lots of compost into the soil will create air spaces. This helps the soil to spring back after it is stepped on. ⚛ Spreading a thick layer of mulch in the garden beds will encourage earthworms. They naturally break up the soil. Very sadly, some parts of our country are experiencing severe drought, while other areas are dealing with extreme flooding. Our thoughts go out to everyone who is affected by such harsh weather conditions. We hope that the weather will be kinder and that life can return to normal very soon. I hope you can enjoy the beauty of the young summer days in your garden this weekend. If you are not a gardener, a walk in the park or through the neighborhood is a perfect way to enjoy a ‘taste’ of young summer days. Respected British horticulturist, garden designer, and writer, Gertrude Jekyll, reminds us all that June is “the fulfillment of the promise of the earlier months.” We have waited a very long time! These young summer days are a delightful treat! Enjoy! P.S. What gardenkeeping tasks are keeping you busy this week? Which June blossoms are your favorite? New Growth… in So Many Ways! 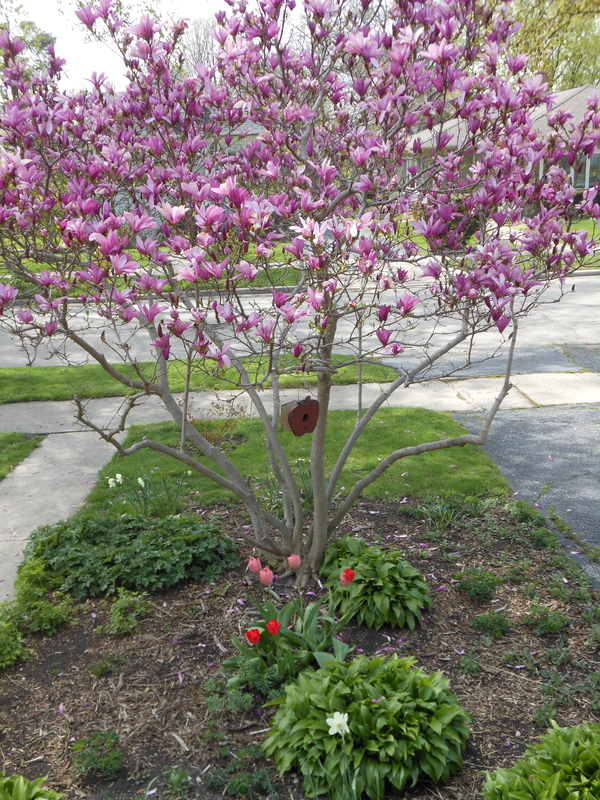 Watching each day as plants emerged under our Magnolia, after such a long winter! Colorful blossoms add such happiness to each new day! So glad that you are here! We’re celebrating the small moments that make each day special! Today, our blog Petals.Paper.Simple Thymes is exactly one month old! You, dear friends, are a big part of this small celebration! ♡ I always say “our blog,” since it certainly wouldn’t be as much fun without you here! As sunshine and showers have nurtured our garden and helped it to flourish over the past four weeks, your visits and kind words have helped our quiet, little blog begin to grow, as well. You are the sunshine and showers that help us grow here at Petals.Paper.Simple Thymes! I must send so much gratitude out to everyone who stops by for a visit during these busy Springtime days! I’ve grown, too! Of course, I’m discovering how to write posts, add media, and how to use the WordPress tools. But much more important than learning how a blog works, I’m discovering what it means to blog! Sharing and connecting with old friends and new friends is why blogging has become important to me. What could be sweeter than discovering kindred spirits, both near and far? I knew I had stumbled upon a wonderful thing the first evening that I clicked “publish” on my first post. Within the hour, a visitor from New Zealand was reading my words. What an amazing feeling ~ both surprised and grateful! In the past few weeks, dear lifelong friends have come often to visit. New friends have shared their thoughts, as we have watched our friendships grow and flourish. Our visitors have come from Germany, Canada, the UK, Russia, Australia, and all parts of the U.S. I’ve met such interesting people ~ gardeners from the Bronx, Savannah, an island in Puget Sound, New England, and closer to home in the Midwest. 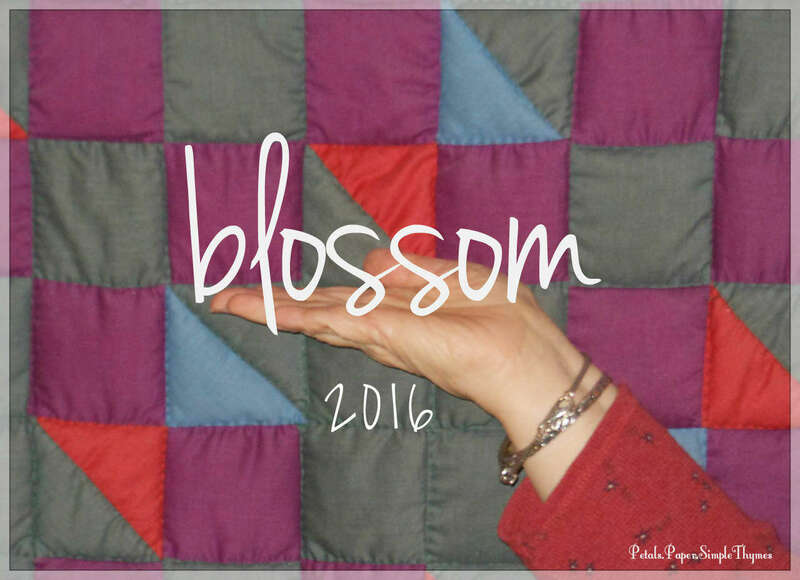 Friends, new and old, have shared the stories of their quilts, their homes, and memories of simpler times with all of us. Readers have shared interesting book titles. So many lovely Girlfriends have dropped by from Susan Branch’s blog to visit. Lots of papercrafters have visited us, too. (I promise to post card making adventures very soon! It’s just so hard in the Springtime, when one passion takes you outside to dig in the dirt, while another other passion must wait for quiet time inside!) My heart sings with gratitude for everyone who has come to visit! “Kindred spirits are not so scarce as I used to think. Anne, you were so right… and I am so grateful! While you are here, let’s take a little walk to see the new growth in our garden on this first day of June. It’s hot and humid today, so a tall glass of iced tea will refresh us as we walk… and soak up the magic of Springtime! 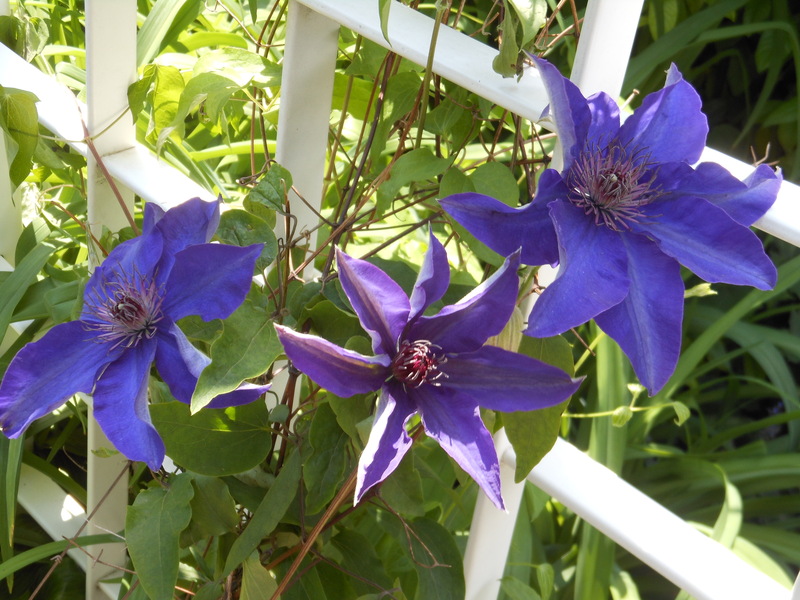 Deep purple Clematis is climbing up the arbor, with new blooms each day. 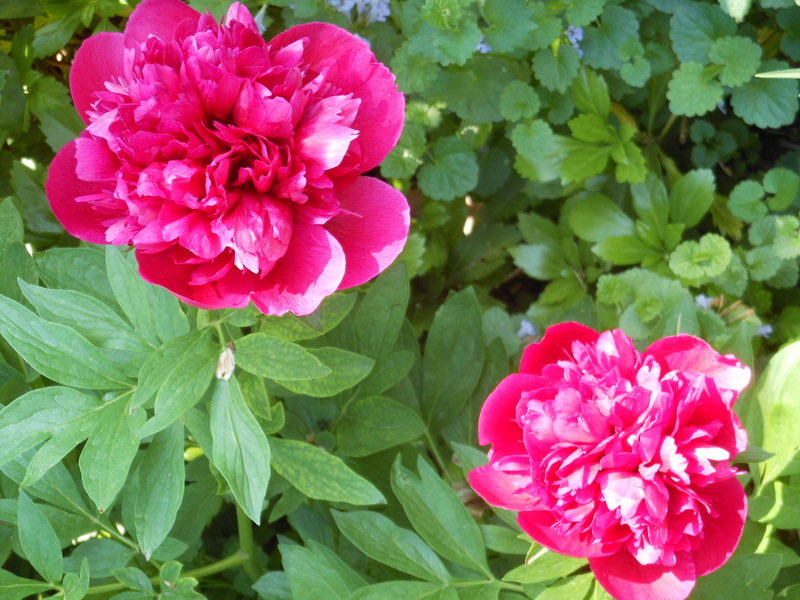 Our Peonies are in bloom now. In a few days, pale pink Peonies will bloom, too. 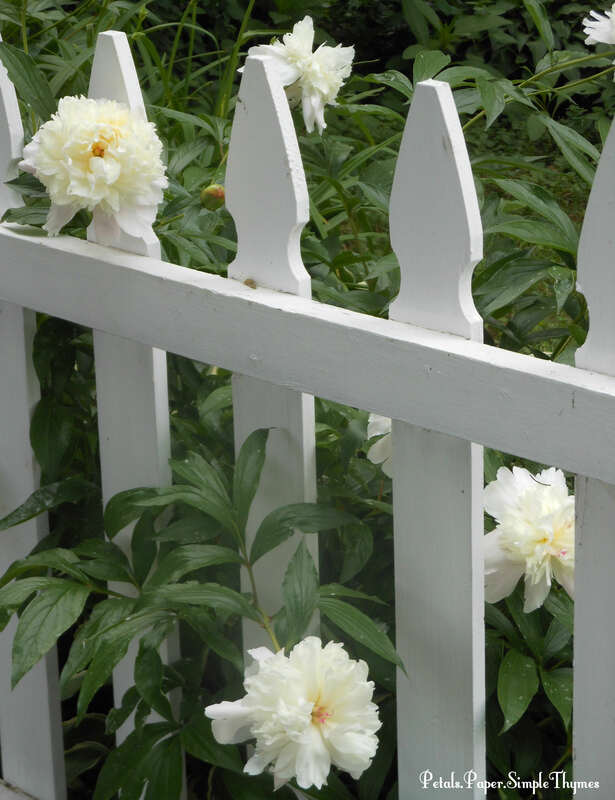 It will be such fun to cut Peonies to fill a crock for the front porch! 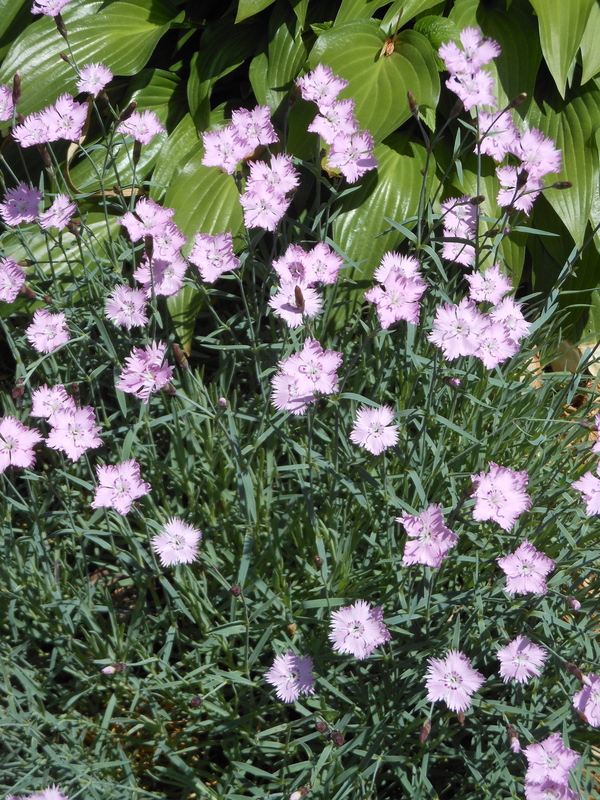 Dianthus blossoms add a hint of delicate pink to the garden this week. 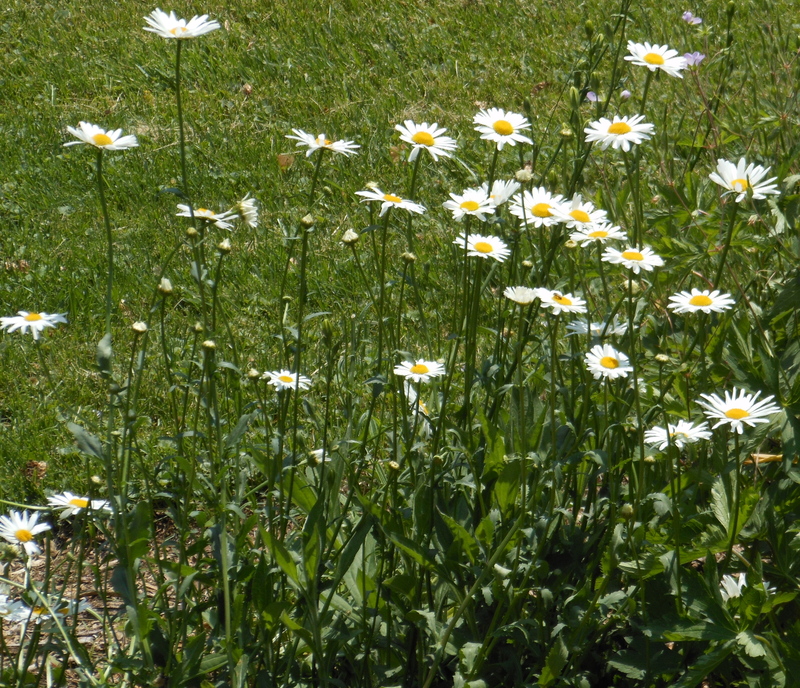 Shasta Daisies will always be one of my favorites ~ so fresh and simple! Thanks for coming to visit on this special day! You are cherished, sweet friends! P.S. Do you read a lot of different blogs? Do you like to leave comments or just visit quietly?